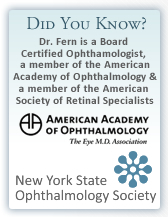 Dr. Fern has specific office hours at each of his offices. When scheduling an appointment please let the receptionist know in which location you would like to be seen. Also, briefly inform us of your eye problem so that the proper amount of time can be allotted for your appointment. If you have special needs or are in need of any special assistance for your visit such as a wheelchair or are hearing impaired, please make the receptionist aware of your needs when making your appointment.